Showing light, applying pressure and keeping clean. In the last two articles of this series I brought to you a handful of useful tips aimed at folks looking to start airbrushing. The first article includes details on the basics of practising and how to get cool effects. The second article is all about bravery, planning and expanding your painting options. In this third piece I’ll be explaining how to pull-off some zenithal highlighting, PSI-management and how to go about cleaning your airbrush. Once again, I’ll be extending my thanks to the fine guys and girls at www.airbrushes.com. They were kind enough to provide me with the stellar Iwata Eclipse HP-CS. This airbrush is a bit of a step up from the Neo for Iwata which was a perfect starter airbrush. Nonetheless, I couldn’t imagine my painting life without my Eclipse at this point. I have achieved all of the effects within these articles using the Iwata Eclipse. 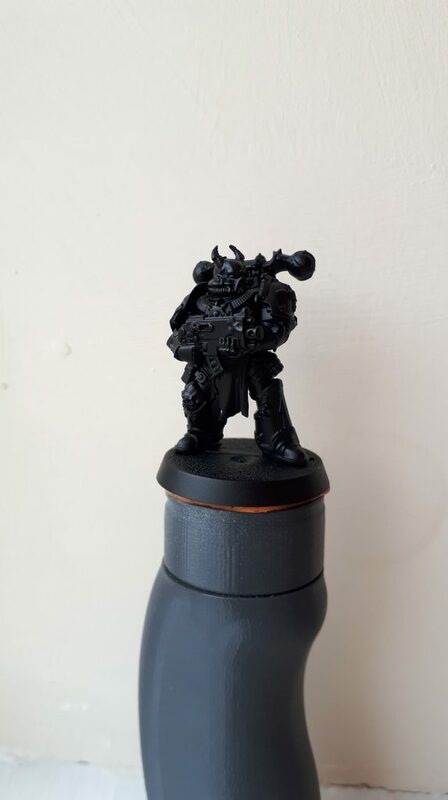 The act of zenithal highlighting is designed to provide a sense of light hitting your models. You can apply this very easily-accomplished effect to help make your models visually pop a little more on the table. The trick is to be consistent and mindful of where light should be coming from. 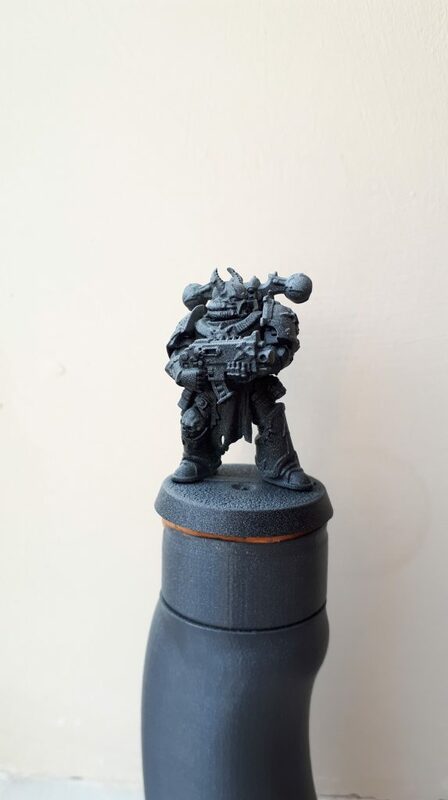 Ideally, you’d prime your models black or a very dark grey all-over. 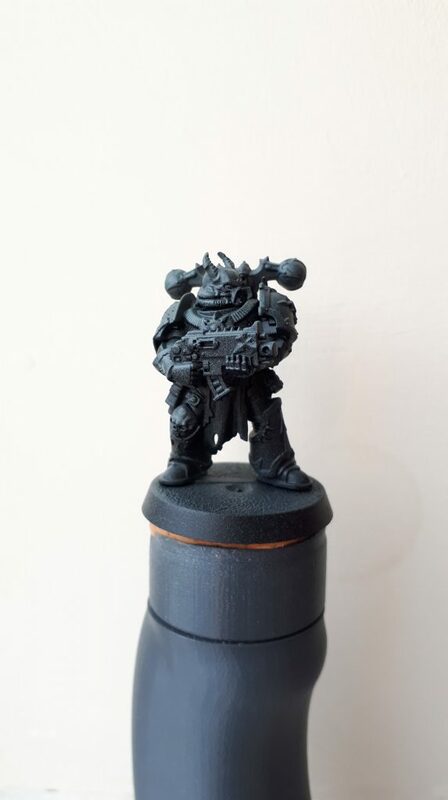 Once dried you go for a mid-tone grey and spray it over the top of the model downwards. You should spray sparingly with thin layers, too. This way the grey will hit all the raised areas of the model but none of the underside where the light would struggle to hit. You should do this across a 90-degree angle over the top of the model for a good, dynamic effect. Once the grey is dry the next step is to spray white over the top of the model but at a 45-degree angle. You should do this sparingly and ensure that you’re hitting all the areas where light would be hitting more prominently. Again, wait for this to dry. When these colours have dried you should see the effect start to take form already at a glance. 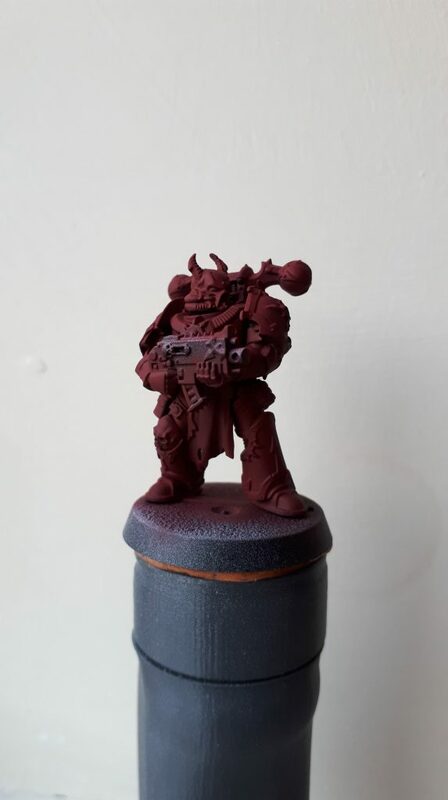 At this point you can coat the model in a colour of your choosing. Once done and dry the effect will be clear and give a good impression of light hitting your model from the top-down. This can really help to make infantry stand-out and not look so washed-out on a table full of models. The trick is to try to do more with less, don’t go overboard! 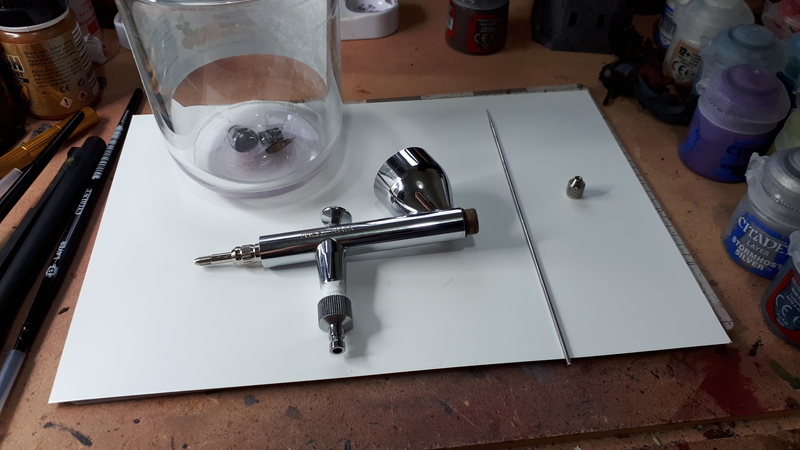 Not to over-simplify, but the compressor in your airbrush setup is vital as this administers the pressurised air to push the air into your airbrush. The pressure itself is measured in P.S.I or pounds per square inch. In my few months experience I’ve found that there’s two main settings you’ll want for this. High pressure allows you to apply more paint over a larger area. Getting between 25 to 30 PSI has proved absolutely fine for when I’m looking to prime miniatures or achieve an all-over base coat. You lose a lot of control this way but for covering a big area with no need to intricacy, you want to be closer to 30 PSI in my experience. The paint will tell you if things aren’t right. On the left the paint is too thing and “spiders” out. To the right of that are various attempts at paint being too thick as shown by the speckling. Finding the sweet spot in-between will come with practise in both thinning your paint and gauging your PSI. For more control and finesse you want to go lower. I’ve dabbled around 12 PSI for more delicate work and this seems sufficient. This will take a lot of practise to get used to, though. Don’t get too frustrated if you’re unhappy with your results the first few times. Naturally, the big gap in the above PSI measurements can be toyed with depending on what you’re painting. 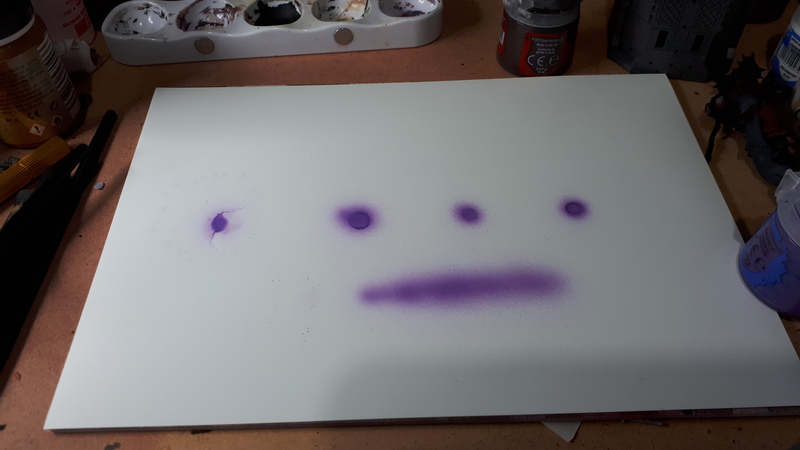 Of course, this can be dependent on your airbrush and compressor themselves but the biggest factor is the consistency of your paint. The thicker the paint the higher the pressure you’ll need. This all comes back to practise in getting your paint to a runny, milky consistency. Once you nail this you’ll get a natural sense of the pressure you’ll need for the job at hand. Clean the airbrush out thoroughly. Firstly, I find it’s best to start by squirting some cleaner into the paint cup/reservoir before swashing it around with a brush. Empty the contents into your waste tub by tipping it out. Do NOT spray at this point or you risk clogging. After a couple of brush-cleans, put a little cleaner into the cup and then back-flush it. To do this, hold your hand over the cap of the airbrush firmly and pull the trigger back a little. This causes the cleaner to flow back and free-up any stuck bits of paint in the cap. Empty the cup into your waste tub equivalent. Finally, you can then put a little more cleaner into the cup before spraying it into your cleaning station until it’s empty. For a quick wash between colours this has seen me through thick and thin. I’ll typically do this each time I am swapping between contrasting colours. Should you be using similar colours you could achieve a more subtle blend by leaving some of the previous colour in the cup when adding the new paint. Unscrew the cap and remove the needle with care from the back of the brush. The needle won’t budge until you loosen the chuck nut at the back of the brush. You should only remove the nozzle if there is a clog or damage. Some models like the Eclipse make cleaning the nozzle far easier, so consult your airbrush manual or guide for this. You then clean the cap and paint reservoir with a cotton bud soaked in some airbrush cleaner. For the needle simply get some kitchen towel with some cleaner on it and simply run it up and down the needle. Be exceptionally careful with the tip of the needle as bending or dinging it will likely require a replacement. Providing you have some small airbrush cleaning brushes you can run these through the body of the airbrush. Again, tip them in some cleaner first to help break down any dried paint. Once it all looks nice and clean you can reassemble the airbrush. Finally, add a little cleaner into the paint cup and then spray it into your cleaning station. When assembling or disassembling your airbrush, take the utmost care. Be sure to check the manual thoroughly before you start taking it apart. It can be fiddly, but when you know how to dismantle it, you’ll be able to thoroughly clean in. Alternatively, there’s the option of soaking the caps and nozzle in some half-cleaner half-water mix, providing there are no rubber o-rings as these may dissolve or get damaged. This is up to you but can prove useful for shifting particularly stubborn paint. Cleaning may not be the most wholly exciting activity, but if you take care of your airbrush it’ll take care of you. If you have any other tips or tricks for airbrushing you’d like to share yourself, do let us know! As always, to be best kept up to date simply hope onto our Facebook page where we regularly post.